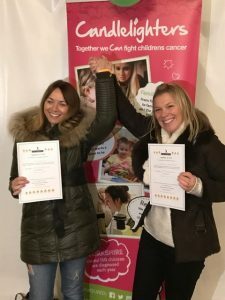 This weekend Lisa Wright and Louisa Weeks-Browning took part in a Fire Walk to raise money for our chosen charity, Candlelighters. The Candlelighters Trust (Candlelighters) is Yorkshire’s pre eminent children’s cancer charity, providing practical, emotional and financial support to children living with cancer in Yorkshire and their families. For more information on Candlelighters www.candlelighters.org.uk.